We hope you can join us for a couple of end-of year events. 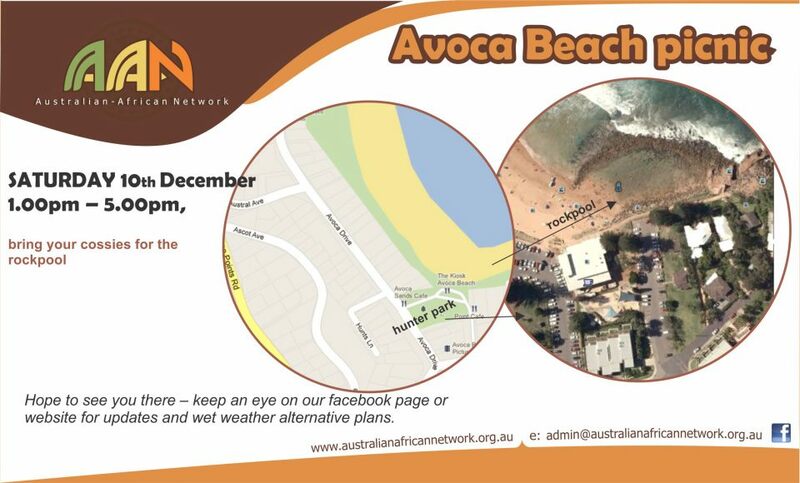 This coming Saturday, 10 December, we are gathering for our last picnic of the year at Avoca beach on the Central Coast from 1.00pm – 5.00pm. More details below. Keep an eye on our Facebook page for updates in case of bad weather. On Saturday December 17 join us for an adults only dinner at the African Feeling Cafe, 501 King St. Newtown from 7.00pm (drumming performance starts at 7.30). Please RSVP to admin@australianafricannetwork.org.au or on Facebook (you will need to joing our FB group first). You are invited to attend AAN’s Annual General Meeting. To make things easier for everyone we decided to hold it immediately before our next picnic (see below). In order to vote you must be a member of AAN, so renew your membership or join now. Download membership form. Hope to see you there. The waterplay park at Steel Park, Marrickville. Bring your cossies and some food to share/BBQ. The waterplay park is a family friendly Park with BBQs, playground, soccer field, and it’s right on a bike path along the Cooks river. Looking forward to seeing you all there. For more information or wet weather plans please call Suzanne on: 0401 869 106. Come and join us for our end of year picnic this coming Saturday – 1.00pm – 5.00pm, 27 November at Johnson Park, Dulwich Hill. Bring special celebration food to share. (There are BBQs). If it’s raining we’ll have it at an AAN members home in Dulwich Hill – ring Cornel for the address: 0402 651 563. Hope to see you there! The next AAN picnic will be 2.00pm – 4.30pm Saturday 25 September at Central Gardens Reserve Merrylands, Cnr Merrylands Rd & Cumberland Highway. Come along and meet new people and families of mixed backgrounds. Bring some food to share, and enjoy good company. The children will enjoy exploring the animal exhibits in the park and there is plenty of room for bike riding or ball games. If it is raining we will meet at Abla’s Cafe nearby on Sherwood Rd. Please contact Suzanne on 0401 869 106 for more details. Hope to see you there! Australian African Network is holding our first Picnic/BBQ for 2010 on Sunday February 14th, at Johnson Park Dulwich Hill. Come along and meet new families similar to your own and let the children have fun exploring the new playground equipment. There is a basketball play area and plenty of room for bike riding. Bring some food to share, and enjoy the good company of others. Cnr Merrylands Rd & Cumberland Highway. If it is raining we will meet at a Cafe close by. Please contact Suzanne on 0417 777 131 for more details. Hope to see you there! Bring your family and hang out with us at the next AAN picnic. Saturday 26 September, 1.00pm – 4.00pm. Johnson Park has enclosed play equipment, a basketball court, and plenty of space for bikes and kicking a ball around. There’s plenty of parking or it’s a short walk from the 425, 426, 428 & 445 Bus routes (get off near Dulwich Hill shops). If it’s raining we will meet at Abla’s patisserie on New Canterbury Rd, Dulwich Hill (but they only serve cakes & drinks, so eat first). Call Suzanne on 0417 777 131 if the weather is uncertain. If it is raining we will meet at a Cafe close by. Please contact Suzanne on 0417 777 131 for more details. Hope to see you all there!